Comp was a fine all-around athlete who lettered in four sports at little St. Benedict’s College and was chosen by the Packers in the third round of the 1943 NFL draft. With the void left at tailback due to the retirement of Cecil Isbell, Comp split time with Tony Canadeo and proved to be a capable passer, completing 46 of 92 attempts for 662 yards and seven touchdowns while giving up four interceptions. He also ran for 182 yards and three TDs and was impressive in the defensive backfield, intercepting a club-record 10 passes, one of which he returned for a score. Packers went 8-2 to finish first in the NFL Western Division. Won NFL Championship over New York Giants (14-7). Comp followed up in 1945 by passing for 865 yards and 7 touchdowns with 11 interceptions for the 6-4 Packers, but with star end Don Hutson’s retirement, his performance dropped off significantly in ‘46. 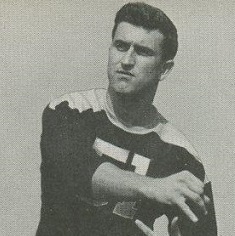 He spent three more seasons with Green Bay, through 1949, and was largely fazed out of the offense as it transitioned to the T-formation. Comp did continue to play well on defense, however, and accounted for 14 of his 34 career interceptions from 1947 to ’49. Overall on offense, he passed for 3354 yards and 28 touchdowns and rushed for 519 yards and seven TDs. Adding in two pass receiving touchdowns and two more returning interceptions, he scored a total of 11 TDs.